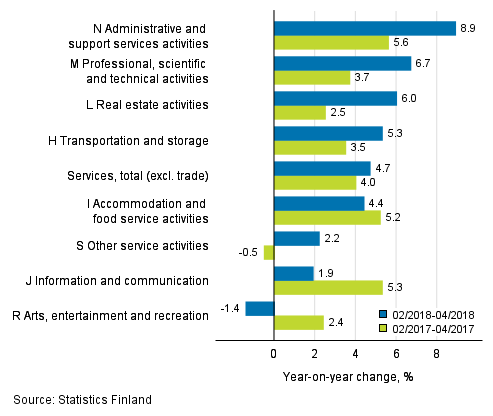 According to Statistics Finland, turnover in service industries grew by 4.7 per cent in February to April from the corresponding time period of the year before. Among service industries, administrative and support service activities grew fastest (+8.9%). Professional, scientific and technical activities (+6.7%), real estate activities (+6.0%) and transportation and storage (+5.3%) also attained faster growth than average for service industries. Services are here examined exclusive of trade. Administrative and support service activities was carried by renting and leasing activities with a growth of 16.6 per cent, as well as employment activities where turnover grew by 11.8 per cent from the corresponding period one year ago. In professional, scientific and technical activities, scientific research and development (+9.7%), and legal and accounting activities and management consulting services (+8.8%) grew most of the subindustries. In the industry of transportation and storage, warehousing and support activities for transportation generated a growth of 6.2 per cent. Growth in land and rail transport was 4.1 per cent while the 3.4 per cent drop in the turnover of water transport slowed down the development of the entire industry. Information and communication activities (+1,9%) carried information service activities with a 13.4 per cent growth but radio and television (-6.2%) and publishing (-5.2%) caused heavy decrease in the industry. ISSN=1799-0998. April 2018. Helsinki: Statistics Finland [referred: 23.4.2019].